"Storyteller: How to be an Audio Book Narrator" publishes today! We are super-excited to announce the publication of our audio book "Storyteller: How to be an Audio Book Narrator", written by - us! We'd been talking about writing this how-to guide for awhile, but this year - with Lorelei's induction into the Audible Narrator Hall of Fame and with it being Creative Content's ten-year anniversary - the time seemed right. 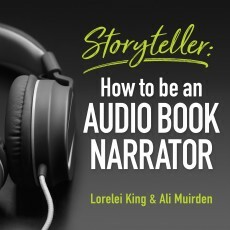 So let narrator Lorelei King and award-winning and Grammy-nominated producer/director Ali Muirden tell you all about what goes into audio book narration and what you can do to prepare yourself for a career in this industry.